The kids are home from school. The Christmas presents need to be wrapped. The in-laws are bored and hungry. Don’t forget the 500 other chores that need to be done to keep the household from falling apart this holiday season. With so many things to do this holiday season, some forget to stop, take a deep breath and just relax. If that is easier said than done, Karen Thomson of Kennesaw may be able to help. Through deep breathing exercises and stretching, relaxation is not out of reach. Ms. Thomson, a teacher of yoga and meditation, said breathing in the first step. The message the deep breath sends to the mind and body is to slow down, she said. Yoga, an ancient system of exercise, incorporates breathing with a series of stretches that affect the entire body and mind. According to Dr. Chris Winzer of Powder Springs WellStar Health Systems, the symptoms of stress are increased irritability, inability to concentrate, anxiety and sleeplessness, which can have a negative effect on the body. Stretching everyday for 15 to 20 minutes and maybe a yoga or mediation class once a week, according to Ms. Thomson, is just what the body needs for relaxation and a general feeling of well being. Waking up 20 minutes earlier to watch a yoga video or investing a good instructional book will help, but she said those who are stressed out can benefit from a yoga group. Ms. Thomson teaches yoga and mediation at several locations around Cobb. In her classes, rather than balls, or straps, to aid in stretching, the class often uses human touch to aid in the healing process and enhance the stretches, she said. Although there are many forms of Yoga, many classes do not include Meditation. Check with the instructor to ensure the class includes this vital element of relaxation, she said. The sun may also play a role in relieving stress. During the winter months, especially, the body needs solar energy. Beginning in January, Ms. Thomson will begin her six-week yoga courses at Kennesaw State University, The Fragrant Plantation, and the Canton Highway Ladies Workout Express. The cost is $89 and registration is now open. For more information call KSU at (770) 423-6765, The Ladies Workout Express at (770) 419-8010 or Ms. Thomson at (770) 424-9763. 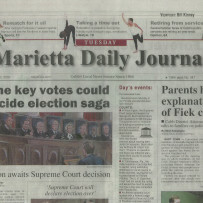 Copyright 2000, 2007, Marietta Daily Journal. All Rights Reserved.